There are very limited etiologies described in the context of this sign. The face of giant panda sign is classically described in patients with Wilson's disease. However, it is also seen in other pathological conditions. Various causes of this appearance have been documented. Hereby, we are presenting a case report which describes this classic sign in patient with space-occupying lesion, which elaborates its differentials. A 58-year-old female came with complaints of few episodes of vomiting followed by persistent drowsiness for 2–3 days. It was not associated with fever. There was no history of tuberculosis. She was nondiabetic and normotensive. There was no history of any neurological deficits or any psychiatric behavior preceding this event. Preliminary blood tests were normal. There was no history of any metabolic derangement or obvious Kayser–Fleischer Ring upon examination by ophthalmologist; however, Wilson's workup could not be accomplished. She was advised for magnetic resonance (MR) brain (plain and contrast), and subsequently, CT brain angiography was also performed. Plain and contrast MR imaging (MRI) brain images were performed on 1-Tesla Magnetom SIEMENS machine. Axial fluid attenuation inversion recovery (FLAIR), T2-weighted (T2W), and precontrast and postcontrast T1-weighted (T1W) images were obtained. Additional axial 3-mm thin fat-suppressed T2W images were also obtained. Imaging findings showed space-occupying lesion in the third ventricle region, appearing isointense on T1W images [Figure 1] and showed intense enhancement on postcontrast images [Figure 2]. 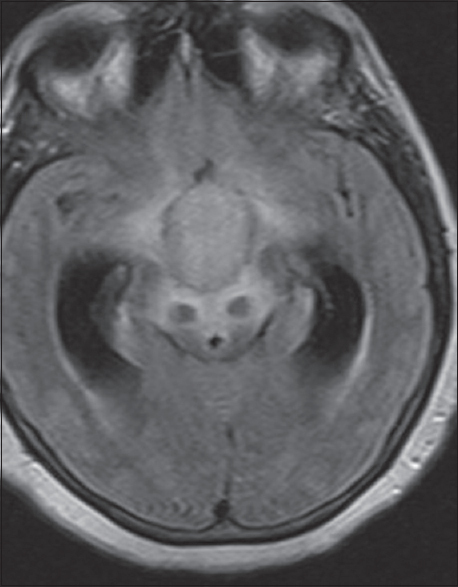 Thin axial T2W fat-suppressed (TE: 122 ms, TR: 5000 ms) posterior fossa section showed the characteristic “face of the giant panda” sign in the midbrain [Figure 3] and [Figure 4]. Hyperintensity signal is seen in the bilateral putamen, thalami, and adjacent white matter [Figure 5]. MRI of the brain is a useful diagnostic modality to evaluate sudden deterioration of neurological status. It could give a clue to its etiology. In our case, there was space-occupying lesion in the third ventricular region, causing mass effect on foramen of Monro and resultant dilatation of lateral ventricle. Hyperintense signal intensity is noted involving brainstem, deep nuclei and adjacent white matter on FLAIR, T2W images and hypointense on T1W images. These regions did not show diffusion restriction or blooming on gradient sequences. 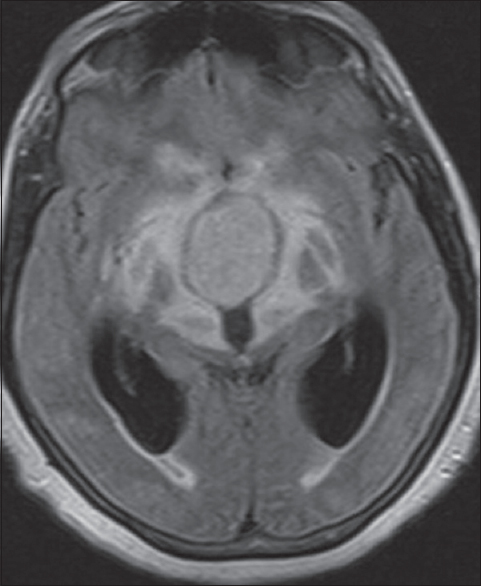 Moreover, on axial images, there was “face of the giant panda” sign seen in the midbrain region, which is regarded as characteristic of Wilson's disease.,, The sign was originally described by Hitoshi et al. It is produced as a result of high signal intensity in the tegmentum with preserved normal signal intensity in the red nuclei (eyes of the panda) and lateral portion of the pars reticulata of the substantia nigra (ears of the panda) and hypointensity of the superior colliculi (chin of the panda). The exact pathogenesis of the superior colliculus hypointensity is not known. In cases of Wilson's disease, it has been postulated that the paramagnetic effect of heavy metal deposition (e.g., iron, copper) may be responsible for this finding. Usually, such late cases of Wilson's manifest with neuropsychiatric illness, but our patient did not have any behavioral changes. On ophthalmologic examination, there was no evidence of Kayser–Fleischer Ring seen. There was no history of any chronic hepatic aliment in this patient, which virtually ruled out possibility of Wilson's disease in our case. Moreover, to the best of our knowledge, there is no literature which describes the association of space-occupying lesion in Wilson's disease. Other causes of appearance of this face of giant panda sign are Leigh disease, hypoxic-ischemic encephalopathy, methyl alcohol poisoning, Japanese B encephalitis, and extrapontine myelinolysis; however, characteristic clinical features of these entities distinguish them from Wilson's disease. This classical sign has also been described in patient with hypertension, but our patient was normotensive. Another case of neurocysticercosis in the midbrain, as space-occupying lesion with perilesional edema, has been noted in literature. 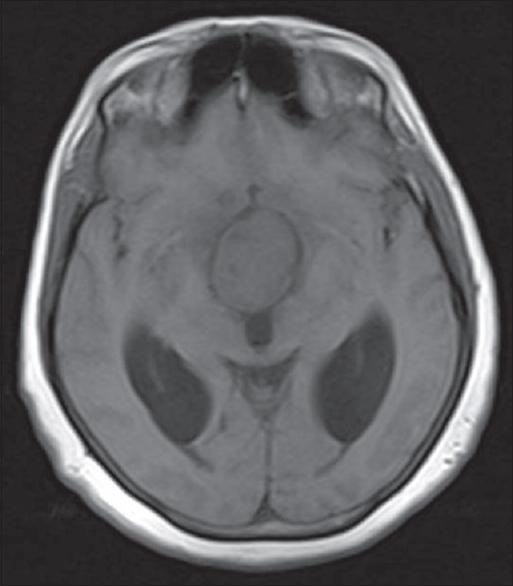 This classic sign has also been described in patient with postradiation leukoencephalopathy. In our case, there was no evidence of previous external toxin intake which could have caused myelinolysis. Absence of any febrile illness or convulsions ruled out infectious etiology. Limited literature description of differentials of giant face of panda sign is available. To the best of our knowledge, there is no literature which has described this classic sign in any space-occupying lesion. Hence, our case of space-occupying lesion in the third ventricle with this classic sign adds a rare differential. Chakraborty S, Mondal S, Sinha D, Nag A. Face of the giant panda sign in Wilson disease. SA J Radiol 2013;17:104. Shivakumar R, Thomas SV. 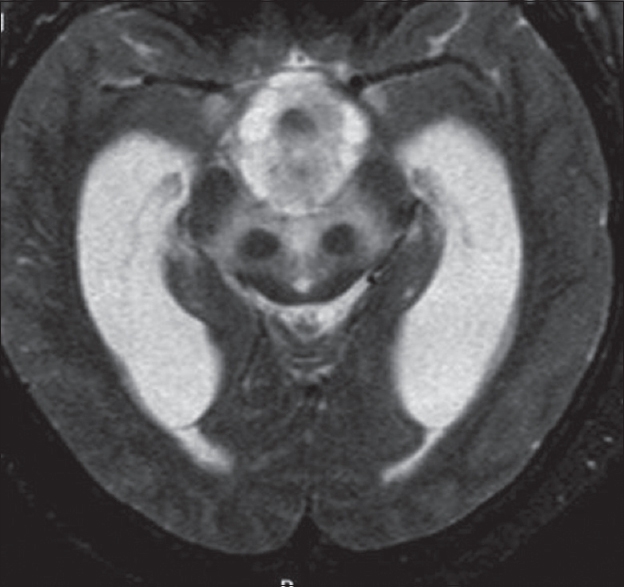 Teaching neuroImages: Face of the giant panda and her cub: MRI correlates of Wilson disease. Neurology 2009;72:e50. Rutledge JN, Hilal SK, Silver AJ, Defendini R, Fahn S. Study of movement disorders and brain iron by MR. AJR Am J Roentgenol 1987;149:365-79. Das SK, Ray K. Wilson's disease: An update. Nat Clin Pract Neurol 2006;2:482-93. Jain RS, Sannegowda RB, Jain R, Prakash S. Reverse 'hot cross bun', 'mercedes-benz', 'face of the giant panda and her cub' signs with pontine infarcts: A radiological pandora. BMJ Case Rep 2014;2014. pii: bcr2013203447. Konanki R, Varma DR, Lingappa L, Shenoy BH. 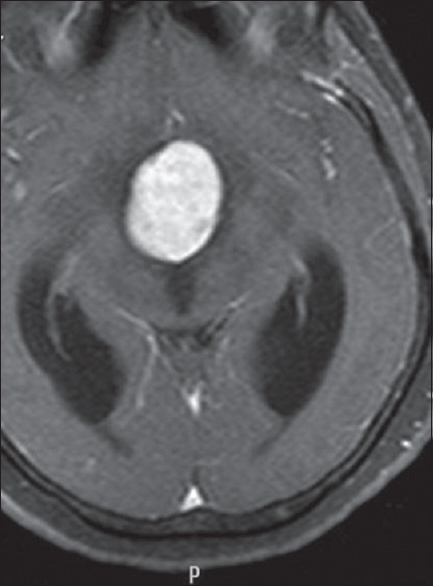 Midbrain neurocysticercal granuloma appearing as “face of panda”. Neurology 2013;80:1999. Khwaja GA, Saxena A, Chaudhry N, Koche S, Satyawani M, Singh D, et al. An Unusual fatal case of severe irreversible non steroid responsive 'early delayed'post-radiation leukoencephalopathy. J Indian Acad Clin Med 2007;8:345.